Back for the fifth installment, Montreal's premiere hi-cut blend of funk carioca, international booty beats and post-tropicalia dancehall nonsense, now in full technicolour and stereophonic sound. DJing by that master of all forms of radio (AM, FM, shortwave, internet) MASALA (masalacism.blogspot.com), and IVORY TEMPLE (myspace.com/ivorytemple), and 21st century video projection magic. 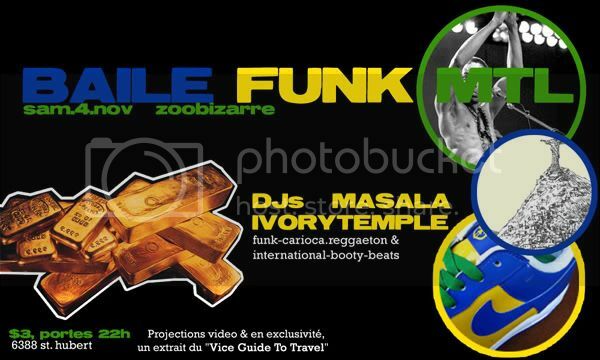 Globe-trotting, genre-hopping, and saliva-swapping with: baile funk, desi beats, Miami Bass, d. south, Washington Go Go, soca, reggaeton, electro, soul, funk, hip house, etc.